Good news from Port Renfrew Marina! It appears another school of spring salmon are passing through Port Renfrew, and fishing on “the Beach” is excellent. Yesterday saw many 30 pound chinook salmon weighed in, and most boats had their limit from mid-teens into the 20s. 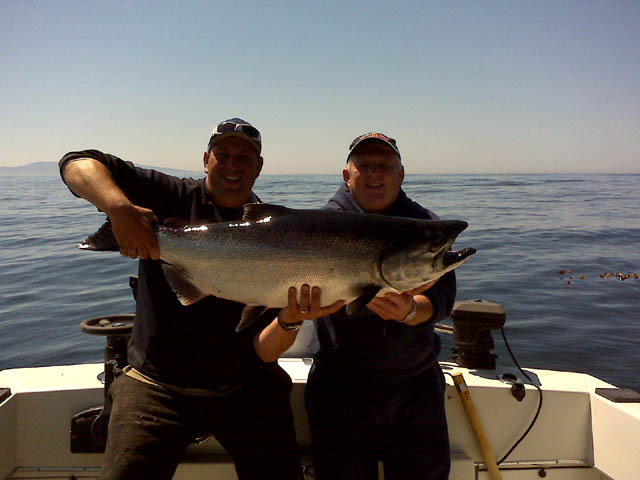 Trevor from No Bananas Fishing Charters sent in this report and photo: “Swiftsure Bank is still very good with limit catches of halibut and spring salmon. The good news is the Beach is finally consistent with many 30-pound plus fish.” The photo is Dan McGiveron with a 42 pound Tyee caught Monday. Nice fish! Time to get out to Port Renfrew…the fishing is hot! 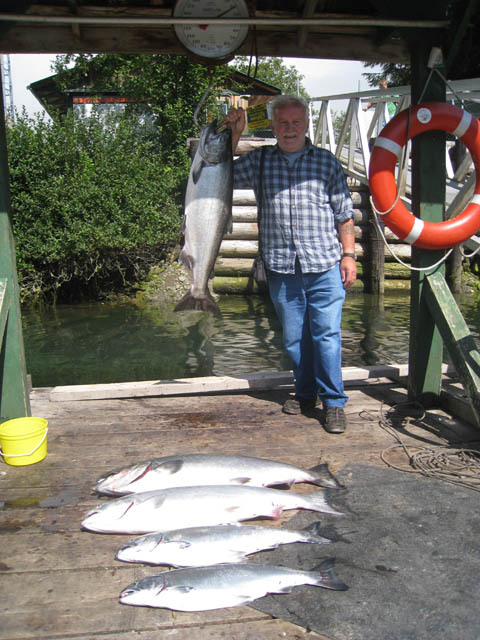 Port Renfrew Marina is seeing Chinook fishing starting to improve. This past week there were far more spring salmon hitting the docks than in recent weeks. One problem is keeping your bait in the water without a Coho taking it. It is not uncommon to go through 3 to 5 packages of anchovies a day in order to get the springs. 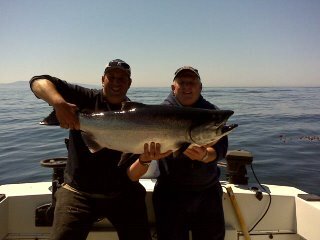 Coho are getting bigger with the hatchery fish in the 5 to 8 pound range being taken both on shore and at Swiftsure Bank. Swiftsure is still the hotspot for Chinook. They are being taken on plugs, spoons and hootchies, the popular colors being in the whites with rainbow shades. They are finding them at a depth of about 170 feet on the downrigger. Please Note: With the fog lately it is advised that you don’t fish the “Chicken Ranch” without radar as the freighter traffic has been quite heavy. The fishing around Port Renfrew continues to be pretty good. The Beach is spotty, with some nice salmon coming in, but you have to put in the hours. Out on Swiftsure Bank, however, the fishing is still excellent, with limits of spring salmon, hatchery coho salmon, halibut, and a ling cod or two thrown in for fish n chips. Des from Vicious Fishing Charters posted a whole bunch of great pictures of fun days fishing from Vancouver Island’s wild west coast…come on down and catch some fish! Port Renfrew’s fishing has been amazing this week. Swiftsure Bank has been delivering up the fish, with quick limit catches of halibut and salmon. The spring salmon are deep, 200′, and are mostly being caught with white plugs and hootchies — up to 20-30 pounds. Coho and pinks are shallower and will bite on pretty much anything…once you’re into a school of them, it is non-stop action. In a trip on Sunday, we couldn’t keep the gear in the water more than 5 minutes without a bite…double headers common. The halibut were small chickens, up to 25 pounds, many caught using the regular jigging with a PowerBait grub or large spoon, but most caught while trolling for salmon deep. 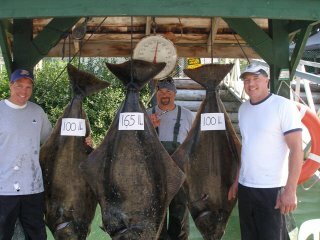 Port Renfrew Marina reports that large halibut have been caught lately too, up to 160 pounds. They are out there if you want to chase them. Closer in to shore at “The Beach”, it has been off and on for the big spring salmon. Persistence is the key, with reports of long days trolling, but with success…many fish in the 30s caught this weekend and a few in the 40 pound class. Camper Creek and East Point are the current hot spots. Come on out to Port Renfrew and get fishing! Pretty good Port Renfrew Fishing to report. Port Renfrew Marina reports a few big salmon and halibut catches, and improving fishing all around. Here’s a photo of Des from Vicious Fishing Charters at the end of a pretty fun day…6 Red Snapper, 9 spring salmon, 4 Halibut one 99 pounds. 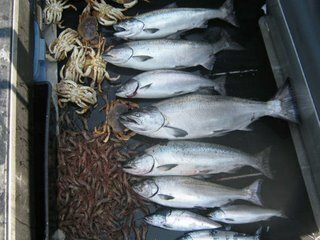 Jolly Rogers Fishing Charters says that earlier in the week The Beach was spotty, but Swiftsure Bank has been really really….huge schools of coho and spring salmon to 25 pounds. There are halibut around too, not fast and furious action, but if you look for them, you can find some. Come on out to Port Renfrew and get your fun in gear. 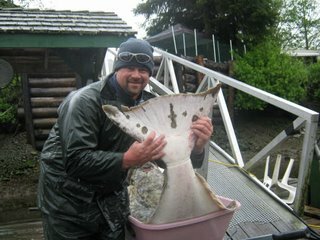 You are currently browsing the Port Renfrew Fishing Report blog archives for July, 2009.